Heriberto "Tito" Gonzalez, "El Trecero mayor", arrived in the San Francisco Bay area in the summer of 2000. His music is typical and primarily "El Son", the music you know from the Buena Vista Social Club. "Tito" plays a Cuban instrument similar to the guitar, called the "Tres". He studied with Tres master Papi Oviedo of the Buena Vista Social Club and then with the greatest guitarist in Cuba, Octavio Sanchez Cotán. He has played with such famous Cuban groups as Conjunto Estrellas de Chocolate, Aribu Quartet and Chapotin y sus estrellas, all from Havana, Cuba. 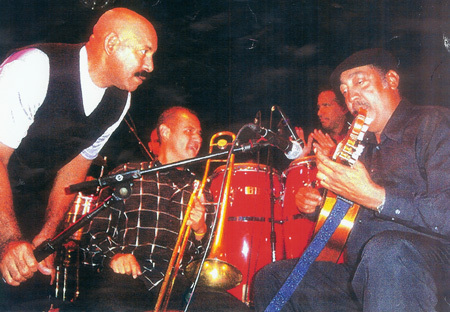 Before leaving Havana, "Tito" founded and played with the Nuevo Conjunto de Arsenio Rodriguez, a group carefully structured to represent the music of the famous Cuban tresero Arsenio Rodriguez. This group was assembled by Arsenio's daugther, Regla Rodriguez Travieso. She thought long and hard as to who should represent and play her father's music. She chose Heriberto "Tito" Gonzalez, a great honor.